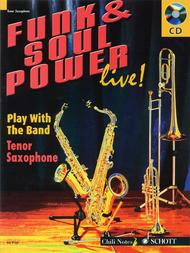 Funk & Soul Power (Play Tenor Sax with the Band). For Tenor Saxophone. Misc. Edition with CD. 64 pages. Schott Music #ED9768. Published by Schott Music (HL.49015688).ISBN 3795757231. 9x12 inches.Who wouldn't enjoy playing one of the wind instruments in the music of Earth, Wind & Fire (Phoenix Horns), Tower of Power, Kool & the Gang, Blood, Sweat & Tears, Michael Jackson (Jerry Hey, Bill Reichenbach) or James Brown (Horny Horns)? This volume introduces the player to cutting-edge Funk & Soul Power wind accompaniments and really makes the six pieces in this edition take off! That's not all, though. You can also take over the role of the soloist, if you like, leading the wind band, accompanied by the funky rhythm section and improvising over simple harmonies. This book will show you how to do it, too. Includes a bonus track for practising the right style of funky phrasing. Get the funk!